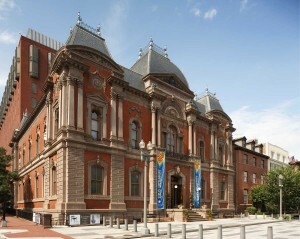 The Renwick Gallery, a branch of the Smithsonian American Art Museum located steps away from the White House, boasts one of the finest collections of American Craft in the United States. The elegant and permanent contemporary craft collection will serve as the perfect backdrop for your next event. Support the museums with a donation and celebrate with a private event. Please contact the special events office for more information. A list of approved caterers will be provided upon request. 	Parking: There are several parking lots and garages near the museums with limited on-street parking at meters. 	Metro Station: The museum is conveniently located near the Farragut North (Red line) and Farragut West (Blue and Orange lines) metro stations. Public Hours – 10:00 am – 5:30 pm; all events that take place in the museum must begin after 5:30 pm. The site is ADA compliant.